Posed in front of "The depot". 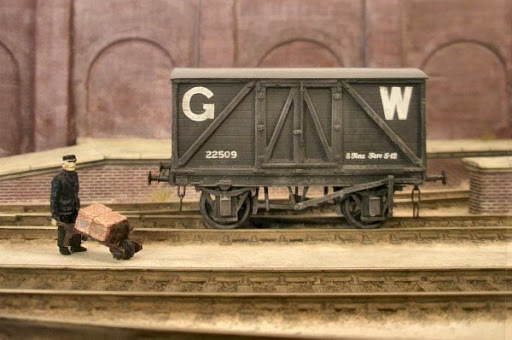 The wagon will form part of the shunting puzzle together with other wagons currently being built. My stock weathering techniques are still rather crude, so any suggestions for improvement are much appreciated! 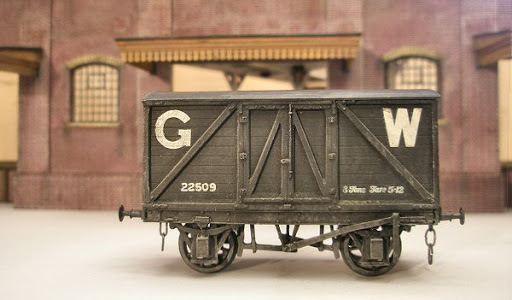 Previous entry Progress on "The depot"
Now I know what you wanted GWR grey for Mikkel.Thats a cracking model and those Geen kits turn out very nice.Did you solder it or chicken out like me. Hi Robin. I chickened out :-) It's all glued, the good (?) old way! Yes the Geen kits are very much "feel-good kits" (ie no stress!). Lovely! I've got a real soft spot for o/f vans and that's a good 'un. I think you're being a little hard on yourself regarding the weathering - most of the photos are larger than life and look fine to me. Nice. The Vallejo range does brush on very nicely indeed, I quite often use them in that way as it's quicker than spraying, once all the cleaning up is taken into account. Yes, outside framing really does add character to a van doesn't it ! On the weathering front, I would ideally like things a bit more subtle, right now it's pretty much grey on grey. I did add a murkish brown brushed upwards on the lower parts, but it doesn't come out. Good to see one of these vans, Mikkel. 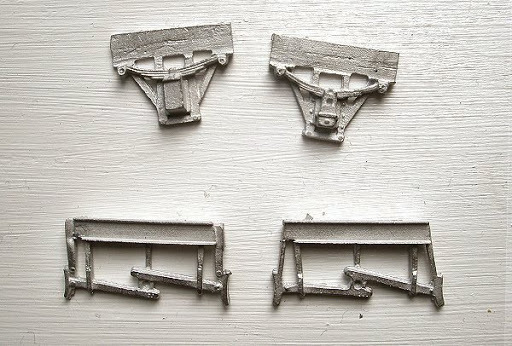 Together with the three plank opens, these David Geen kits have been on my list of things to do for some time. As you say, the outside frames do add character, just another part of the attraction of ealy stock. For some reason these vans made me think it would be nice to build the body in real wood. Does anyone do that anymore? Just for the record, rainstrips have now been added. It seems they were only over the doors at first, later extended to cover the full length of the roof. Very good wagon! 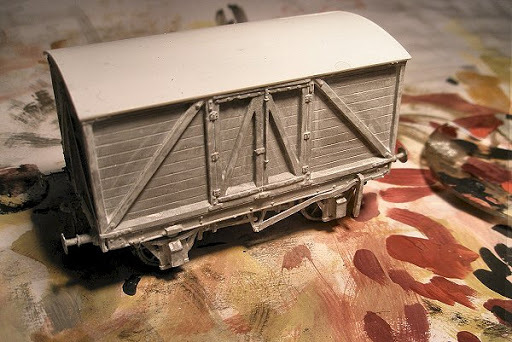 Simple weathering is often the best. "I haven't been able to find any record of when the reversible shoes were introduced?" I thought I had read somewhere that the reversible shoes were introduced sometime around 1910 but can't find where I read it. Hi Dave, many thanks for that info. 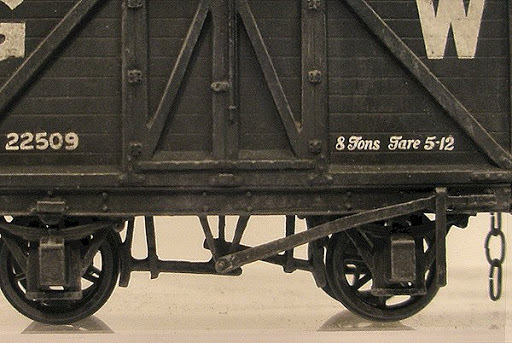 A quick look through Atkins et al does suggest that wagons constructed after this date all have the reversible type. 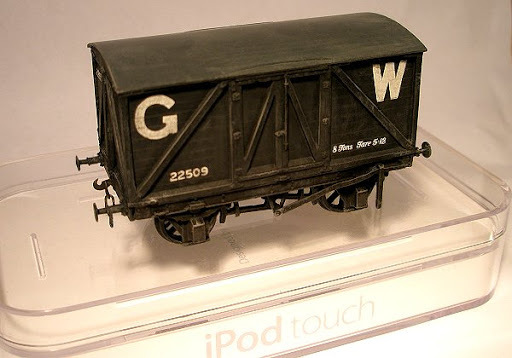 I wonder if the non-reversible shoes were replaced on older wagons within a short period of time, or if they continued carrying them?